Yesterday, We (The Bilbo Blogger developers) have announced that it reached its version 1.0 milestone. It’s a feature reached desktop blogging client, built up on KDE KBlog library, So supports all of Blogger 1.0, MetaWeblog, MovableType, WordPress and Google GData (used on blogspot blogs) APIs. Supports uploading files via FTP and MetaWeblog (MovableType and WordPress) API media uploading. And some other features you can see on its homepage. What’s new on this release? We have released a beta preview of what will be the Bilbo 1.0 on 28-June, and we were working on it to fix known bugs, that you can see some of them on its release notes. I have take some times on it to make it compatible and usable on Windows, and wrote some articles about it on its wiki. I was in touch with KBlog maintainer, Christian Weilbach, (who’s the kblogger maintainer too) to merge back my fixes for KBlog to it. and we talked about Bilbo as a replacement for KBlogger in KDE. Because currently we have a fork of KBlog (called BilboKBlog) in Bilbo source code and Bilbo uses it. Great project! Have been using bilbo for my wordpress account several months – its simple and powerful at the same time. Now that i found blazeblogger, i dont need this kind of stuff anymore, since i am independent of any blogging apis and so on, nevertheless its great to see one more piece of KDE come into place! 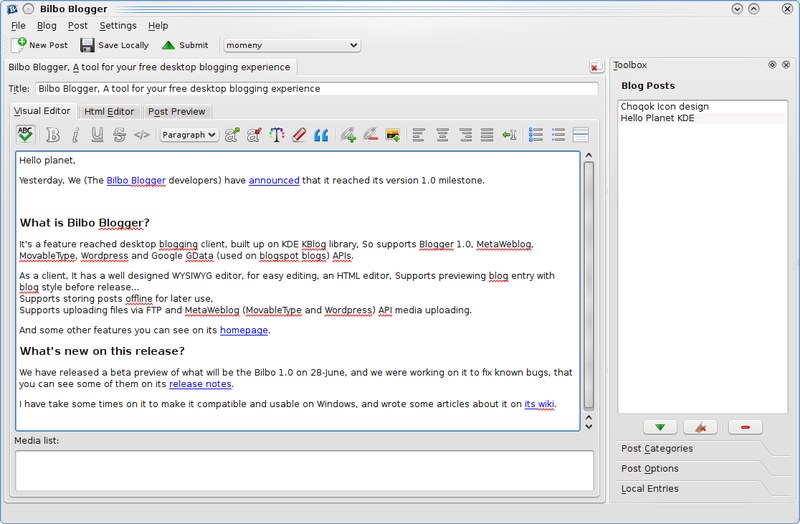 Came across Bilbo Blogger a little while ago and now use it in Fedora 11 and Sidux 2009-02. Thank you for something that I’ve been looking for in GNU/Linux for a long time and has been a long time coming. Good job well done. Any chance of making it cross platform, eg. BSD and/or mac (macports)? I just done some windows related fixes to make it available on windows. I just installed it and did my first post. Worked great. Just want to say a big thank you!! I have recently downloaded Bilbo from the repositories. I liked the interface and the offlines features. However, I have never been able to connect Bilbo to my blog. I have copied and pasted the web address of my blog and I have put my username and password as I have on Blogger. However, Bilbo doesn’t find those parameters and is not synchronizing with my blog, which is a Blogger 1.0 -allegedly supported from Bilbo. Does Bilbo need a library that I am missing? Have you ever had noticed any problem like that?